While more people are interested in eating organic produce for health reasons, there’s another reason you should support organic farming: the threat the negative environmental effects of “Roundup” pose to your health. I always try to eat organic whenever I can, and I’m happy to see that many more people are doing the same these days. In fact, 45% of Americans actively attempt to include organic food in their diets. There are many reasons people choose to consume organic produce. It may be to avoid genetically modified organisms (GMOs), to improve their nutrition as many believe organic produce contains more nutrients, or to simply eat produce that they believe tastes a lot better. But perhaps the number one reason to consume organic produce is the lack of chemical content. Eating organic foods simply allows you to avoid consuming pesticides, herbicides, insecticides, and other chemicals that could be harmful to your body. I think most people can agree that chemical exposure is bad for your health, but what about chemical exposure through the environment? The environmental impact of non-organic foods may also be detrimental to your health. Peer-reviewed research supports the toxic effects of the most popular agrochemical and herbicide around the world—Roundup, also known as glyphosate. Roundup may be in the air you breathe or the rain that waters your organic backyard garden. In fact, a 2011 University of Minnesota study found glyphosate in 60%–100% of tested rain and air samples from the U.S. It can also lead to the spread of pathogenic bacteria. Not long ago, a study published in the Brazilian Journal of Microbiology suggested that Roundup may increase the environment’s growth of the pathogenic bacteria Pseudomonas aeruginosa (or P. aeruginosa). What does this mean for your health? Conventional produce is not only your concern when it comes to exposure to glyphosate. The herbicide also contaminates reservoirs, rivers, canals, and streams. Non-oxygen and oxygen forms of P. aeruginosa are found in many of these watercourses, especially after a rainfall. The study found that the biofilm-forming pathogenic bacteria strains could thrive when exposed to various concentrations of the genetically modified contaminant runoff. The bacteria biofilm colonies can lead to antibiotic resistance of serious infections, such as waterborne infection, pulmonary complications from cystic fibrosis, and skin infections. P. aeruginosa can lead to ear infections, skin rashes, and eye infections. The bacteria can hospitalize people with a weak immune system, and can cause pneumonia, blood infections, and even death. In another study published in the journal Biochemical Research International, researchers found that Roundup is 125 times more toxic than its active ingredient glyphosate. 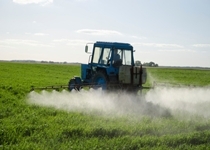 The study observed nine active ingredients within nine popular pesticides, including three herbicides, three insecticides, and three fungicides. The pesticides were compared to their active ingredients. What was most alarming? Eight of the nine pesticide formulas were up to 1,000 times more toxic than the active ingredients. What is the best way to avoid pesticides, herbicides, and other chemicals? Organic produce is definitely the way to go whenever you possibly can. However, for many families, eating organic can be a challenge for many reasons, budget constraints and product availability being the top two. If you find it difficult to eat completely organic, I suggest following the “Dirty Dozen” and “Clean 15” lists from the Environmental Working Group for some clarity on the better foods to buy organic. Finally, one great way to start reducing your exposure to chemicals like Roundup—and hopefully do so for the next generation, too—is to support local, organic farmers. Organic production emphasizes crop rotation, cover crops, soil preservation, pollution reduction, and overall ecosystem protection. Organic farmers aren’t putting in all that effort for nothing. Stop buying commercial, non-organic produce and spread the word about the negative effects of Roundup on the environment and our health. Hopefully, this can lead to the reduction of Roundup in our air, water, and soil. “Organic Agriculture,” United States Department of Agriculture web site; http://www.usda.gov/wps/portal/usda/usdahome?contentidonly=true&contentid=organic-agriculture.html, last accessed March 11, 2015. Riffkin, R., “Forty-Five Percent of Americans Seek Out Organic Foods,” Gallup web site; http://www.gallup.com/poll/174524/forty-five-percent-americans-seek-organic-foods.aspx, last accessed March 11, 2015. Schneider Lima, I., et al., Influence of glyphosate in planktonic and biofilm growth of Pseudomonas aeruginosa,” Brazilian Journal of Microbiology 2014; 45(3): 971–975. Chang, F., et al., “Occurrence and fate of the herbicide glyphosate and its degraate aminomethylphosphonic acid in the atmosphere,” Environmental Toxicology and Chemistry March 2001; 30(3): 548–555. Ji, S., “Roundup ‘Weedkiller’ Feeds Antibiotic Resistant Bacteria, Study Finds,” GreenMedInfo web site, January 2, 2015; http://www.greenmedinfo.com/blog/roundup-weedkiller-feeds-antibiotic-resistant-bacteria-study-finds. Ji, S., “Roundup Herbicide 125 Times More Toxic Than Regulators Say,” GreenMedInfo web site, April 14, 2014; http://www.greenmedinfo.com/blog/roundup-herbicide-125-times-more-toxic-regulators-say. Mesnage, R., et al., “Major Pesticides Are More Toxic to Human Cells Than Their Declared Active Principles,” BioMed Research International 2014; 2014: 179691, doi: 10.1155/2014/179691. “Pseudomonas aeruginosa in Healthcare Settings,” Centers for Disease Control and Prevention web site; http://www.cdc.gov/hai/organisms/pseudomonas.html, last accessed March 11, 2015.